Most parents already know that sugary sodas and greasy potato chips are not the healthiest food choices for children. But what about the hundreds of other widely available and kid-friendly packaged foods  pastas, frozen dinners, granola bars  that at least appear to be more wholesome? A new Canadian study suggests that even these foods  most of which make nutritional claims on their packaging  aren't all they profess to be. University of Calgary researchers analyzed the nutritional benefit of more than 360 such products, often marketed as "fun foods," which are aimed at children either through kid-friendly package graphics or tie-ins with children's TV shows and movies. Three-quarters of these foods, for example, came in packages bearing cartoon images. Researchers did not include junk food in their analysis, but they found that nearly 90% of kid products still did not meet established nutritional standards. What's more, 62% of the foods that researchers deemed to be of "poor nutritional quality" made positive nutritional claims on the package  such as being low-fat, containing essential nutrients or being a source of calcium. "If a parent sees a product that makes specific nutritional claims, they may assume that the whole product is nutritious," says author Charlene Elliott, a communications and culture professor at the University of Calgary. "Our study has shown that that is definitely not true in the vast majority of cases." Elliott's study, funded by the Canadian Institutes of Health and published in the July issue of Obesity Reviews, shows that successful grocery shopping requires real savvy. For one thing, parents should not be swayed by packaging; researchers found that 8% of the nutritionally deficient items carried some type of official mark or seal of nutrition on the front of the package. About one-fifth of products implied health by showing images of cartoons playing sports. Elliott warns that even if some of the claims on the packaging are true, the foods may still be detrimental to overall well-being. 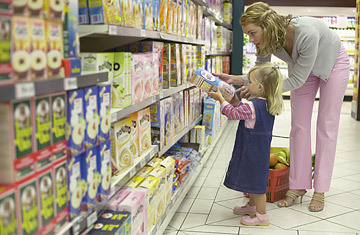 To judge the overall value of each food, researchers used nutritional standards set forth by the Washington-based nonprofit Center for Science in the Public Interest and adapted from guidelines by the National Alliance for Nutrition and Activity, a coalition of more than 275 American nutritional and health organizations, including many state health departments. While acknowledging that not all foods marketed to children can be nutritionally perfect, the guidelines establish acceptable limits for fat, sugar and sodium content. Foods were determined to be of poor nutritional quality if more than 35% of total calories came from fat, or if they contained more than 35% added sugars by weight. The sodium content cut-off for full meals was 770 mg; for pizza, sandwiches and main dishes, it was 600 mg; and for individual servings of cereal, soup, pasta or meat, the sodium limit was 480 mg. By law, food labels must contain enough information to allow consumers to calculate all measurements. The food industry has long been under fire for advertising directly to children. They're an irresistibly lucrative target  children under 12 are estimated to spend more than $25 billion a year themselves, and may influence another $200 billion that is spent. But there's no doubt that some of that spending contributes directly to childhood obesity  32% of American youngsters are overweight, and 50% of the calories kids under 18 eat come from fat or added sugars. Public-interest groups and Congress have urged companies to stop targeting ads to children, and many, including McDonald's, General Mills and Kraft Foods, have taken some steps to comply, by, for example, eliminating cartoons and other kid-centric tactics in their marketing. But consumer advocates say the industry hasn't gone far enough. "We need globally agreed restrictions, implemented through national regulation," says Emily Robinson, campaigns manager for Consumers International, which operates in 115 countries. If companies are left to police themselves, Robinson laments, they'll simply continue with the same minor initiatives announced so far. She adds: "We fear this piecemeal approach is confusing." Ask any parent in a local grocery-store aisle, and she'll probably agree.